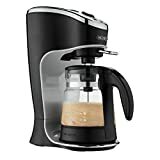 Amazon.com Price: $599.95 (as of 2019-04-25 14:06:07 GMT) Product prices and availability are accurate as of the date/time indicated and are subject to change. Any price and availability information displayed on Amazon.com at the time of purchase will apply to the purchase of this product. The Mr. Coffee Café Latte makes delicious drinks with one simple touch, providing a quick, easy, and affordable solution for latte lovers. This latte maker’s automated process will brew up to 24 ounces of coffee or espresso, heat and froth milk, and automatically shut off the power once your drink is ready.